A stain blocking, multi-purpose acrylic primer for interior & exterior use. Has excellent adhesion on a variety of substrates & can be applied on most architectural surfaces. Will provide excellent "grain crack resistance" & flexibility needed for the durability of exterior wood surfaces. On redwood & cedar exhibits excellent tannin stain resistance. Has excellent efflorescent & alkaline resistance that makes this product an excellent choice for stucco & masonry substrates. 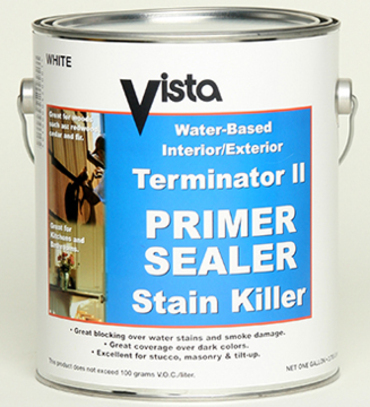 Recommended Uses: Terminator II has a variety of adhesion properties for interior/exterior wood, galvanized metal, steel, aged alkyd paint, stucco, tilt-ups and masonry. Terminator II will also block most household stains.